Though he was primarily known as a bottler of soft drinks and mineral water during his long career in Wilmington, Joel B. Bryant also brewed popular specialty ales at a time when lager beer was king. 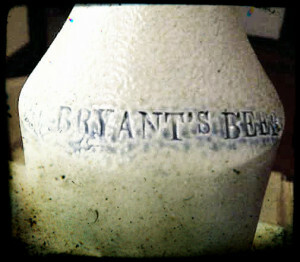 A native of Cheshire, New Hampshire, Bryant moved to Philadelphia in the early 1840s and brewed and bottled mead, spruce and root beer at his brewery on 96 Cherry Street. In May 1848, Bryant removed to Wilmington and opened at similar business in the basement of the Black Horse Hotel on the southeast corner of Front and Justison Streets. Ten years later, he moved his bottling operations down the street to 609 W. Front Street, where he brewed his mead and spruce beer and also bottled porter and ale. Aside for a brief period in 1862 when Bryant ceded control of his business to the outfit of Stephens and Christy, he operated his bottling house and brewery until his retirement in 1883. He died five years later in Wilmington at the age of 78.